She took flight from her hive’s landing board; leaving tens of thousands of bees at home in the hive. She was just over twenty-two days old and this was her sixth and final post in the colony. Her four wings strong and glistening under the spring sun, the nectar flow was calling her every fiber to come and drink. Dust particles hit her fuzzy body during flight, causing her to become positively electric. No matter, her mission was to find a vast nectar and pollen source and report back to the others. Through a north-south-sun-circular-rotation dance she would shimmy and shake to reveal her treasured findings when she returned to the hive. The “waggle dance” choreographed perfectly through abdominal wiggles danced over the hexagon comb, her sister’s would pay close attention to the direction. More wiggles, left and right movements, the farther the source’s location. Today, she didn’t have to fly far. A field of dandelions caught her attention. The negative charge of the flowers below, amply signaling their pollen and nectar was readily available, pulled on her body’s positively electric charged hairs indicating it was a choice area to land for the day. Landing on the fluffy yellow flower, one of thousands in the field, she set to work. This would be her choice plant for the day. Carefully stepping between the pedals, she inserted her proboscis into the flower’s face and began sucking the sweet nectar, filling her honey sac to later unload at the hive. Her Velcro-like body inadvertently collected the flower’s pollen causing the sticky pollen grains to pull from many stamens’ anthers (male) in the dandelion’s florets. The pollen grains will hopefully be transferred to this dandelion’s many stigmas (female) or another dandelion’s. The flower’s hope of reproduction hugely relies on this sticky hug from the busy bee. Mingling the hug to other dandelions insures a genetic diversity, providing thriving generations of plants. One grain, traveling down the shoot of the style will bore into the flower’s face, into the cup of the flower, where the ovary and eggs await the grain of pollen to fertilize and grow seeds. She flits and hovers to other dandelions. Filling her nectar sac with delicious sugars and the “baskets” on her back legs with grains of pollen. She is starting to feel the sun’s turn past afternoon to evening. It is time to travel home. If rain catches her she must find shelter beneath the plants or elsewhere and hope she does not freeze. Less than seven miles from home, more likely three or four, she is heavy with the day’s harvest. This was her 10th trip of the day and it is showing in her mood. Landing back at the hive’s entrance she had made her way through the airport hub’s traffic, each forager showing bright baskets of yellow, orange, and other vibrant colors – their choice flower’s pollen. The guards at the entrance check their scent, only allowing those with the right I.D. to pass. Inside she is helped with her treasures. Nectar and pollen is stored for future consumption and “bee bread” is made for the baby bees in various stages of development. She is tired and ready to rest. When I pop the lid to peer through the small oval opening of the inner cover, many of her and her sisters come to the top. Their small antennae signaling to each other the odd site of the beekeeper, they probably could smell me before I even arrived. “Hello,” I say to the sweet friends. They look like they all are wearing fur shawls on the rooftop of some special palace. Equal duty and curiosity reflected in their hundreds of eyes. “Hello,” they seem to whisper back, curious why I am there. Sometimes I am there to inspect their work, provide sugar water to give an extra boost to their wax production and baby rearing. Other times I am counting frames, deciding if they need to move to a bigger home, or if I need assist to keep predators away (hive beetles, varroa mites, and so on). Ultimately I feel humbled by the relationship. I am not an owner of bees, but an ever learner in “keeping” them. The drones, males, amble about the combs with big eyes and bigger bodies than their sisters. Hoping to have their one and only chance at a night’s love. They are still essential, their pheromones giving off a balance to the hive, in my opinion, as important as the one and only queen. The queen is evasive. Rarely do I find her. She is guarded better than the President. It is fitting, for she is The Queen. Without her the hive is lost. Without her the hive will die. Without her a hope and a future are small. This understanding is what drives the honeybee to work constantly. It is her purpose, it is her skill, it is her talent, it is her beautiful life in the warm hive with a bountiful family. It is her beautiful life among the flowers in the field. It is her beautiful life as a honeybee. I am constantly amazed at the science of how these girls are essential to our lives. Almond pollination relies on them 100%, apples 90%, cherries 90%, oranges 90%, peaches 80%. Cotton, strawberries, cocoa, coffee, and many more crops have to have pollinators to thrive and often survive. The feel of bees humming over my hands, sometimes gloveless in summer, is breathless. The significance we all share in contributing to each other’s lives carries on with the honeybee. It is fun to learn from other beekeepers. The Beekeepers Guild of Southeast Virginia has taught me more than I could have ever learned from books. 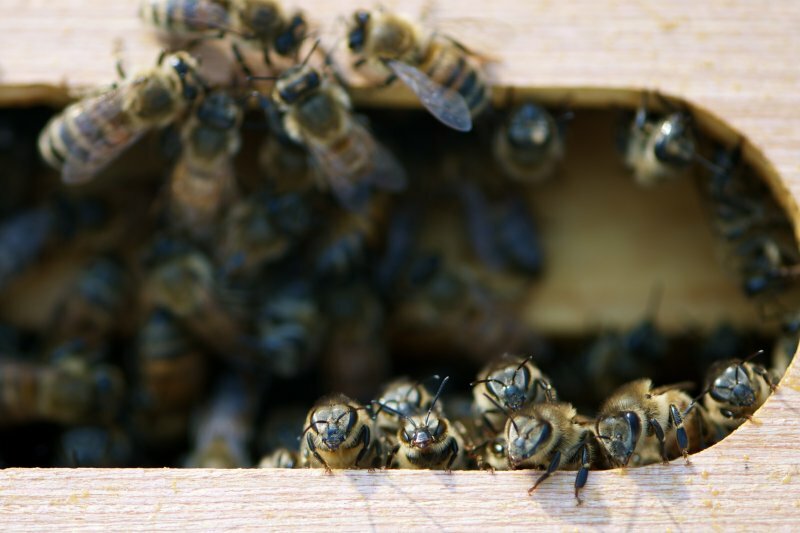 Of course, you ask five beekeepers how to do something and you’ll get five different answers. Honey is an outstanding food source. NEVER spoils (if stored properly). Honey contains flavonoids, antioxidants that help reduce the risk of some cancers and heart disease. Anti-bacterial, anti-fungal, and the list goes on. Plus, if it is truly honey (raw), it tastes so good! Buy their honey and wax products. The sales will most definitely go straight back into the cost of beekeeping. One hive with frames and foundations cost me $150. That doesn’t include bees, suit, or time invested. And most beekeepers need multiple hives to make the effort worth it. Plant honeybee friendly plants (jasmine, lavender, vegetable garden, etc.) or let your wild dandelions grow! Call your local bee association if you see a swarm. 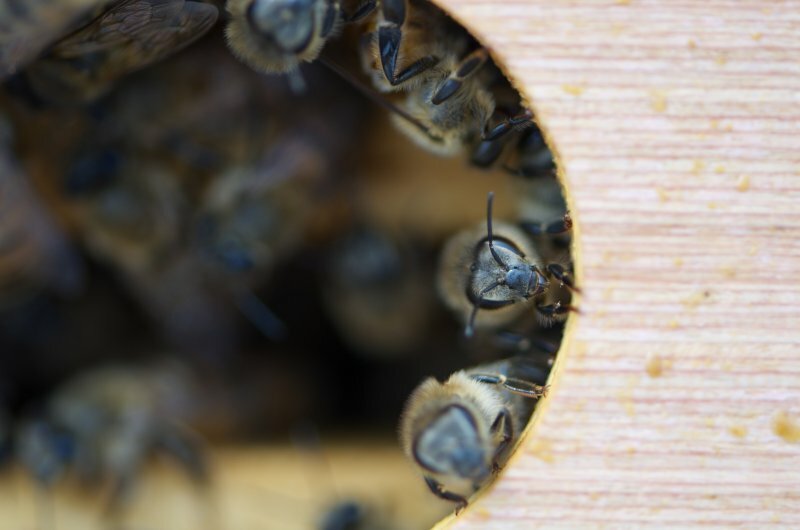 Bees are very docile in that stage and can easily be taken to a hive to thrive! 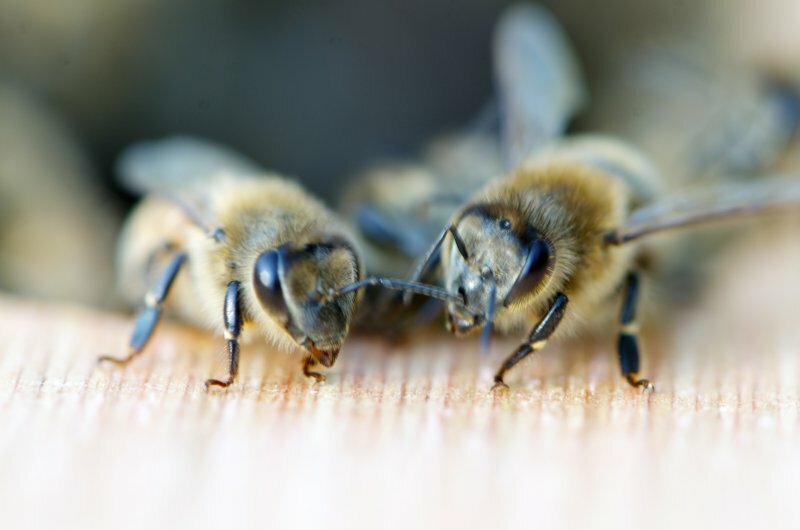 Learn about honeybees and how they, like many pollinators, effect all our lives. Thank a beekeeper for helping your flowers grow by keeping local bees. Check out my latest You Tube video. Just last night I was gifted a swarm of bees Dave K. from the Guild collected out of a tree. Thank you Dave and all my fellow Beeks from the Beekeepers Guild of Southeast Virginia! Welcome All! Local Event! 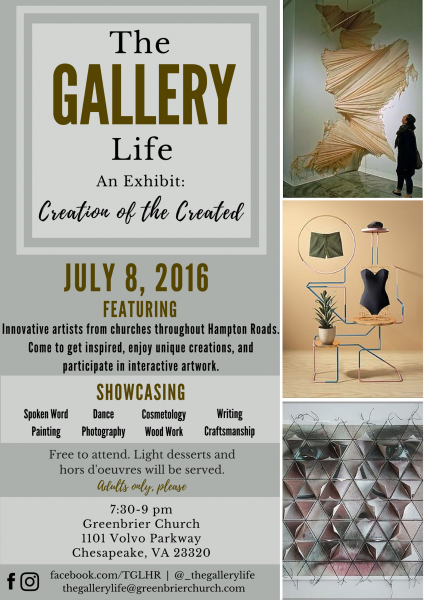 Come to an art show featuring many local artists and yours truly’s honeybee themed oil paintings. How cool is that?! I love seeing the artist in you. So inspiring. Keep that creative flame burning, girl. Thanks Crystal! Hope your writing is going well! As in this post was too long? Wonderful Charity! Like Father, like Daughter – love it! Your children are just getting the best of the best teachings and hands on ever!! They are blessed and they will know it! You and Chris are doing such a wonderful job and we are so happy we are in your lives!